Oh the possibilities of the RiNo Promenade! We are thrilled that the recent round of meetings at Denver Parks on the proposed RiNo Promenade was successful. The plan, to build a linear park that follows a stretch of the South Platte River between 29th and 38th streets, is moving forward. It’ll take three or four years to complete, but we can’t wait! We would relish the opportunity to enjoy a beautiful pedestrian walkway in our neighborhood. 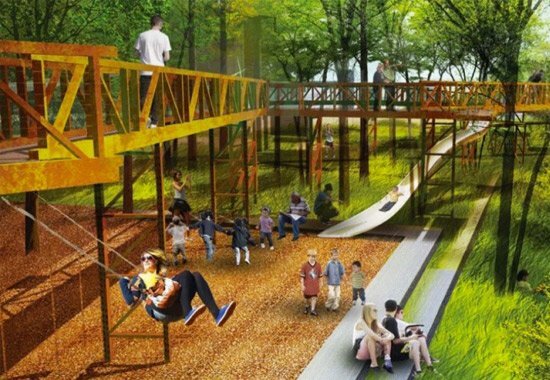 There’ll be gathering spots scattered along the walkway, including a playground for all the young at heart. Pleasures will include art sightings, people-watching, strolling, enjoying Colorado’s beautiful weather, and watching the sunshine bounce off the river. In our city, where citizens are passionate about being in the great outdoors (preferably in motion), a river park is the perfect way to connect our human world to our beloved natural world.